The products I've been sampling this week have all been from Live Native, a brand that specialise in natural skincare, using only clean, pure and fresh ingredients. I was sent a few trial sizes to try out from Detox.Me so here's what I thought of them! 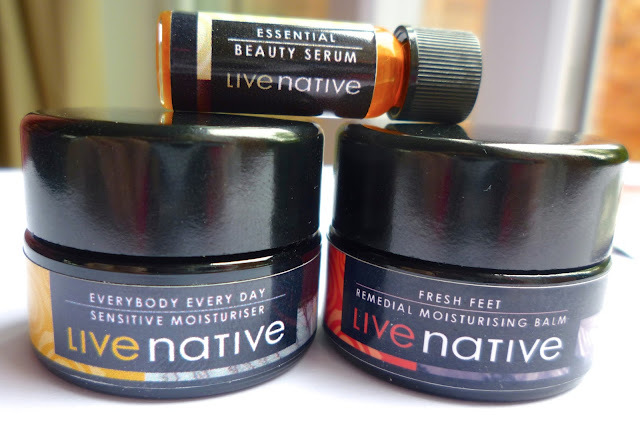 Live Native Everybody Every Day Sensitive Moisturiser* (5ml trial size £5.00, full size 100ml £43.50) is a super gentle moisturiser that can be used all over your body and is suitable for everyone; men, women, children and even babies. This moisturiser is particularly ideal for fair, young, sensitive or problem skin. The key ingredients feature a blend of aloe vera, shea butter, coconut oil and vitamin E which are great for smoothing, hydrating and protecting the skin. I've been finding it perfect to use after being in the sun as it soothes and calms the skin, absorbing really quickly. It's definitely a product I would consider buying in the future, although it is a little pricey. Live Native Fresh Feet Moisturising Balm* (5ml trial size £5.00, full size 30ml £21.90) is great for massaging into tired feet after a long day. This balm contains coconut oil, aloe vera, shea butter, vitamin E, neem seed oil and tea tree oil, all of which contribute to its anti-fungal and anti-bacterial properties. I really like this foot balm as it absorbs quickly so you don't have to walk around with sticky feet afterwards! Another product I am considering buying in full size. Finally, the Live Native Essential Beauty Serum* (2ml trial size £5.00, full size 20ml £39.99) is a light and absorbent serum designed to promote a healthy skin tone and complexion. It contains some great ingredients including argan oil, carrot oil, rosehip, white tea and sea buckthorn extracts. I've been using this serum at night time instead of moisturiser and I have noticed a slightly brighter skin tone already after just using it a few times. I've had a great first impression of this brand and will definitely buy more from Live Native in future. If you've tried any products from Live Native before I'd love to hear what you would recommend! I've never heard of this brand before but I'll have to keep my eyes out for it. Thanks for the review! I'm dying to give Live Native a go, everyone always raves about their products. I definitely want to try that moisturiser! WOW I would have never even thought about a foot balm. But after so many long days at work and when you're on your feet at events on the weekend, that's the best idea ever!! These products sound so lovely! Pretty pricey but I love the fact you can buy the sample sizes.